It is true that there are a lot of good applications out there, but you should think twice before installing the likes of Savesaler onto your computer. 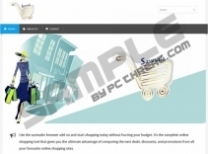 It is an adware application that is responsible for displaying annoying adverts on popular online shopping malls. You must remove Savesaler from your computer because adware programs are not 100% safe. They are not direct computer security threats, but cybercriminals tend to exploit these applications for their own financial gains. What is more, it is possible for adware programs to get exploited by cybercriminals, so there is a chance that you could get infected with malware too. It is not exactly clear where Savesaler comes from. We know for sure that this program does not have a direct download link because the official website at savesaler.info is nothing but an empty shell. The information provided at the main page claims that Savesaler is there to collect all the data on discounts and coupon offers across your favorite online shops. The application is supposed to inform you whenever there is a discount on particular goods that you like. However, in such a case it means that the application needs access to your web browsing data. Savesaler is most probably employing tracking cookies to collect information on what you search for online, and which websites you frequent. A lot of programs do that to provide users with a better service, but you should not tolerate an adware program doing that because it might lead to serious computer security issues. For example, Savesaler could leak the information collected to suspicious third parties, and your data could be used in online marketing schemes. Not to mention, that Savesaler generates your online profile in order to display custom commercial ads whenever you access supported online stores. It goes without saying that you must not click Savesaler ads as they might contain outgoing links to dangerous websites. You might even end up downloading more adware onto your computer. In fact, it is very likely that you have more than just Savesaler installed onto your PC right now. According to our security research team, this program travels bundled with third-party installers, so it is possible that you have installed this application onto your system together with some freeware app you download recently. Luckily, it is not hard to uninstall Savesaler manually. You can do it following the instructions below, but keep in mind that manual removal seldom deletes all the adware-related files and registry entries. Also, you most probably have other potentially unwanted programs on your computer that must be removed as well. Hence, do acquire a powerful antispyware application that would scan your PC and delete all the remaining unwanted files. For any further questions, please leave us a comment. Open Uninstall a program and remove Savesaler. Go to Uninstall a program and remove Savesaler. Open Add or remove programs and uninstall Savesaler. Quick & tested solution for Savesaler removal.